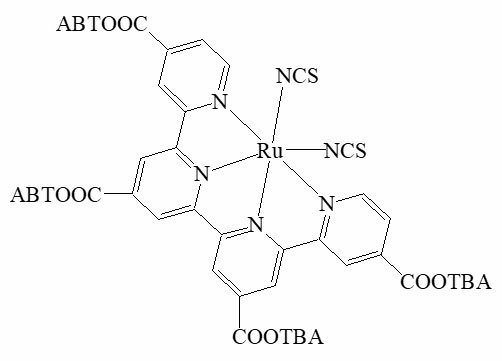 We have many results especially for synthesis of organometallic complexes among organic syntheses. In addition, we can provide contract synthesis, test and evaluation at low cost, using the laboratory in India. Solar cells create an electron from an absorbed photon. If it is able to absorb the wide-range wavelength, it highly improves photoelectric conversion efficiency. 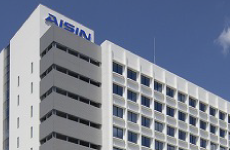 Our institute developed RGD-3 as a high-efficiency pigment. (Japanese Patent 4691779, US Patent 6,437,130). 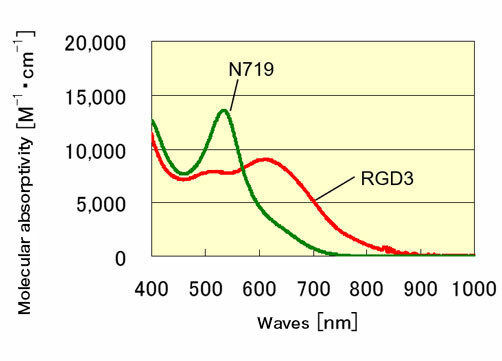 Compared with the N-719 dye known as a dye for solar cells (red die), it has a broad absorption band (less than 400 nm to over 900 nm) as and is called green die from its color tone. Phthalocyanine is known for it’s high weather-resistant blue pigment. For now, the electrical performance is about 85% compare to conventional materials, but the cost is expected to be greatly reduced. We are developing new dyes to improve the function. 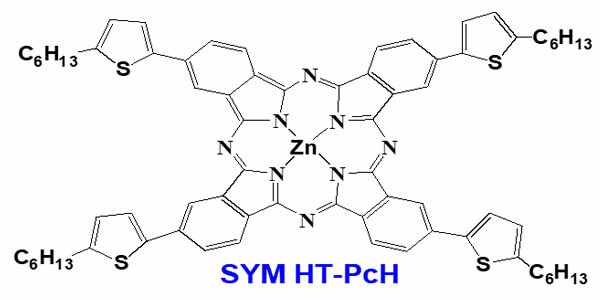 We conduct synthesis and purification, analysis and evaluation of organic compounds such as porphyrin with a similar structure as phthalocyanine, tetrapyridine and phenanthroline which have the different number of ligands, as a basic structure, including phthalocyanine which is an organic compound coordinating Cu, Zn, Fe, Ni. We can also conduct molecular design introducing carboxyl group, alkyl chain, and halogen, depending on the purpose and application, since spectroscopic property, electrochemical property, and solubility are influenced by side chain. Some metals produce a lot of byproducts by catalysis. Accordingly, we are accumulating the expertise on the timing of introducing metals in such cases. Meanwhile, we carry out measurements of HOMO and LUMO levels by cyclic voltammetry for the functional evaluation of organic semiconductors.